Three volumes of her pocket diaries are currently held at the Historical Society of Pennsylvania. The diaries provide us a social “snapshot” into a life within a historically elusive group of people. Emilie lived and worked in Philadelphia during the late-1800s and is believed to have been in her late teens or early twenties when she began her diaries in 1863. 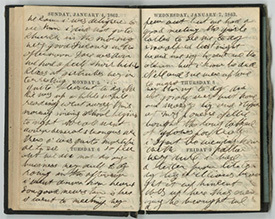 It is within the simplicity of these diaries’ entries that we witness, through the eyes of a young, free African American woman, National Fast Day, the flight of residents from Gettysburg to Philadelphia during the Battle of Gettysburg, the fall of Vicksburg, and the funeral procession of Abraham Lincoln.